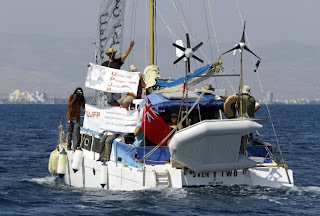 Today Israeli Navy has once again attacked another Gaza Aid Ship of Ireland and took control of it. The Ship was carrying for Gaza and it was left from Turkish port on 28th of May 2010. The Aid Ship was having hundreds of people in it that where going to Gaza. Now the Ship has been taken to Israel’s Ashdod port. Just few days ago Israeli Navy attacked another Aid Flotilla in which over 20 people where killed while hundreds where injured. These people where from different countries in which Parliamentarians, Journalists where included. Israeli Navy killed many of these people by Shot In Head At Close Range and did Fake Propaganda that they where carrying weapons.